If you’re looking for a major difference between the last midterm election in 2010 and the one coming up in 2014, we’ve got one for you: gubernatorial incumbency — the lack of it in ’10 and the abundance of it in ’14. Back in ’10, just a baker’s dozen of the 37 incumbent state governors were running for reelection. That cornucopia of open statehouses (24) produced lots of turnover. Republicans added a net six governorships, including the plums of Ohio, Michigan and Pennsylvania. * The GOP’s new total of 29 governorships was the most the party had held in a decade (Republicans hold 30 of 50 now). It was the flipping of statehouses that was most impressive in 2010. Republicans grabbed 11 governorships that had been in Democratic hands, and despite a bad environment nationally, Democrats seized five from the GOP, including the big prize of California. That’s close to half of the available statehouses shifting parties all at once. In this polarized, hyper-partisan era, where Red is Red and Blue is Blue and never the twain shall meet, that’s an impressive degree of change on one Election Day. Democratic incumbents aren’t running in Arkansas, Maryland and Massachusetts, while Republican incumbents are stepping down in Arizona and Nebraska. *** It is also possible that one or more of these three governors could be defeated in a party primary: Lincoln Chafee (D-RI), Tom Corbett (R-PA) and Pat Quinn (D-IL). Even if they all lost their primaries, which is unlikely, the number of incumbent governors running in the general election would still be a modern record (26 is the highest since 1960, most recently in 2006). By no means does our tentative conclusion suggest that no significant shifts are on the horizon. There will be a few headline defeats, inevitably. The current top candidate is Pennsylvania’s Gov. Corbett (R). While it is uncommon to classify any incumbent governor as an underdog at such an early point in the cycle, Corbett is a rare case: His numbers are dreadful, and he seems to us to be a particularly maladroit politician, prone to painful gaffes, who is also probably too conservative for his state. A recent Quinnipiac poll sums up his problems: His approval rating is stuck at an awful 35%, and he trails his largely unknown potential opponents by about 10 percentage points (more on Corbett below). How bad is it for Corbett? Even an internal GOP poll shows him struggling mightily. The Democrats’ most vulnerable seat is Arkansas, but that’s because popular Gov. Mike Beebe — a Democrat whose 2010 reelection was so dominant that he didn’t lose a single county — is term-limited. 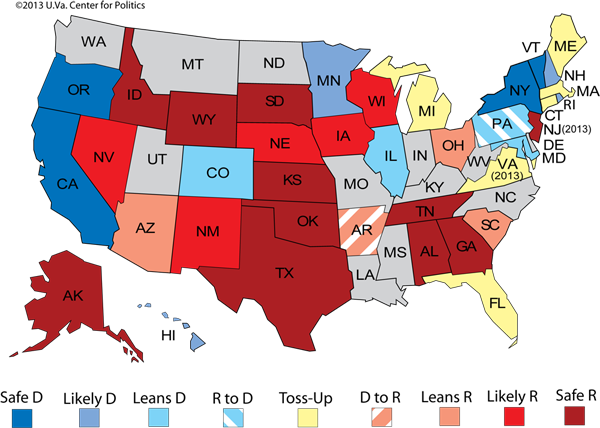 Chart 1 shows our rating changes for this gubernatorial update, and Map 1 shows every state’s rating. To see our full gubernatorial race chart with all the declared and potential candidates, click here. Below the ratings map, we detail what’s going on in each race. *You can argue the GOP actually gained seven, since Florida went from independent Charlie Crist to Republican Rick Scott, but Crist had been elected as a Republican. Take your pick. **There are only 36 gubernatorial races being contested in 2014, compared to 37 in 2010, because 2010 featured a special election for Utah governor. 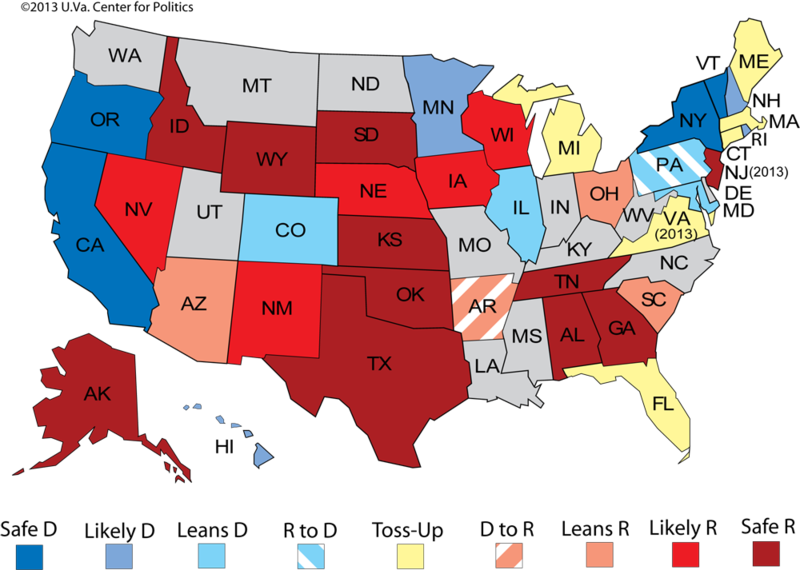 Statistics on incumbent governors come from Vital Statistics on American Politics 2011-2012. ***Arizona Gov. Jan Brewer (R) wants to run for a second full term, contending her inherited short term from 2009-2010 shouldn’t count against her, but she is almost certainly constitutionally barred from doing so. Arkansas: The contest for the governorship in the Razorback State has gotten more interesting following the decision of ex-Rep. Mike Ross (D) to join the race. As a February poll indicated, Ross would likely be more competitive against ex-Rep. Asa Hutchinson (R), the GOP favorite, than ex-Lt. Gov. Bill Halter (D). The Democratic establishment is rallying around the moderate Ross while encouraging the more liberal Halter to consider running for the U.S. House instead, but it appears Halter has no interest in acquiescing. There will also be action in the Republican primary, where Hutchinson will face off against businessman Curtis Coleman and state Rep. Debra Hobbs. However, whereas the Ross-Halter primary matchup could be quite competitive, Hutchinson seems a strong bet to win the GOP nod. Although Ross polls better against Hutchinson than Halter, he still polls behind the Republican frontrunner. Given the lay of the land and the state’s sharp Republican turn in recent years, this race remains LEANS REPUBLICAN. Arizona: After narrowly losing to now-Sen. Jeff Flake (R) last November for a seat in the U.S. Senate, former Surgeon General Richard Carmona (D) publicly mulled running for governor in 2014. But in March, much to Democrats’ chagrin, Carmona opted to not run, saying it was too soon for another major campaign. Carmona’s decision leaves ex-Arizona Board of Regents President Fred DuVal (D) as the lone Democrat in the race, though state House Minority Leader Chad Campbell (D) may also jump in. While Secretary of State Ken Bennett (R) has yet to announce his candidacy for the governorship, he would likely become the favorite in the GOP nomination race if and when he declares. Until we know more, the conservative leanings of the Grand Canyon State make this race LEANS REPUBLICAN. Colorado: Ex-Rep. Tom Tancredo (R) was so incensed by Gov. John Hickenlooper’s (D) decision to temporarily reprieve the execution of a man on death row that he will seek the GOP nomination for governor. Calling Hickenlooper’s choice “the last straw,” the controversial former House member is ready to take another shot at the Centennial State governorship. Back in 2010, Tancredo opted to run as the Constitution Party’s gubernatorial candidate against Hickenlooper and Dan Maes (R). Tancredo wound up winning 36% of the vote to Maes’ 11% while Hickenlooper cruised to victory with 51%. Considering Tancredo’s past performance and opposition to immigration reform in an increasingly diverse state, establishment Republicans are rightfully wary of his candidacy. That said, the incumbent has hit a rocky patch: A June 13 poll by Quinnipiac found Hickenlooper leading Tancredo only 42%-41%. That survey result runs in the face of polling from only a couple months ago that showed the incumbent looking strong for reelection, and it certainly has given us pause. The Quinnipiac survey indicated voters strongly disapprove of Hickenlooper’s death penalty reprieval. That issue, combined with recent gun control legislation, could be problematic for “Hick” in the long run. While we have a tough time seeing Tancredo actually beating Hickenlooper in a rematch, another Republican, such as Secretary of State Scott Gessler, might have a shot in this race. 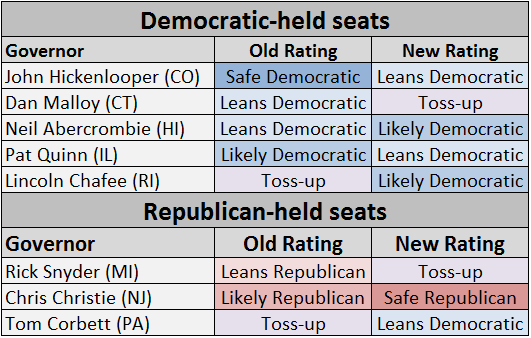 While it’s possible that Hickenlooper is just at an artificially low point, we’re moving Colorado to LEANS DEMOCRATIC. Connecticut: Although Gov. Dan Malloy’s (D) approval rating improved after the state passed a new, more restrictive gun law in the wake of the Sandy Hook tragedy, it looks like the incumbent is back in hot water. The latest Quinnipiac poll shows Malloy trailing his 2010 opponent, Tom Foley (R), 43% to 40%. Moreover, the survey found that only 44% of voters thought Malloy deserved to be reelected, with majorities disapproving of his handling of the economy, taxes and the state’s budget. Despite Connecticut’s Democratic tilt, Republican governors held the governor’s office for 16 straight years before Malloy won in 2010, and Nutmeg State voters may be willing to return the GOP to power. Odds are, Foley won’t have the Republican field to himself, with state House Minority Leader Lawrence Cafero (R) and state Sen. Minority Leader John McKinney (R) also looking at the race. But Quinnipiac’s survey showed Foley has an early edge over his GOP counterparts, though name recognition is a factor at this point. It’s clear that Malloy is struggling to stay afloat — we’re now calling this contest a TOSS-UP. Hawaii: On May 2, Rep. Colleen Hanabusa (D) decided to challenge recently appointed Sen. Brian Schatz (D) in the Democratic primary for U.S. Senate, taking much of the drama out of the Aloha State’s gubernatorial race. Gov. Neil Abercrombie (D) has been viewed as vulnerable, with an approval rating sitting around 40%. While Hanabusa is still running against Abercrombie in a sense (Schatz is his appointee), the sitting governor must feel much better about his chances of securing reelection. With no solid Republican opponent on the horizon, the state’s heavily Democratic lean means this race is now LIKELY DEMOCRATIC despite Abercrombie’s troubles. Illinois: Former White House Chief of Staff Bill Daley (D) has formed an exploratory committee for a gubernatorial run, setting up a possible primary battle against sitting Gov. Pat Quinn (D) and Illinois Attorney General Lisa Madigan (D), who is also expected to challenge Quinn. With an incumbent governor conceivably facing off against two major players from his own party in an explosive primary, the Land of Lincoln may have one of the most interesting campaigns in the country next year. A poll from Crain’s/Ipsos in April showed Quinn with an abysmal 18% approval rating, which explains why Quinn will likely have at least one intraparty challenger. On the Republican side, state Treasurer Dan Rutherford is the current frontrunner. A recent survey of GOP primary voters found him leading 2010 nominee Bill Brady (R), who hasn’t announced yet, and state Sen. Kirk Dillard (R), who is in. Venture capitalist Bruce Rauner (R) is also in the hunt for the Republican nomination after announcing his entry on June 5, and he can self-fund. Overall, the excitement level of this race will probably rest on Madigan’s course of action. If she gets in, the general election will likely be a snoozer. But if she declines to run, things could get much more interesting. Daley’s strength as a candidate is unclear, as he has never run for elected office, while Quinn’s weakness is clear. If Madigan isn’t the nominee, Republicans could very well have a shot at winning. With Madigan’s status in this race still up in the air, we’re shifting this race to LEANS DEMOCRATIC. Maryland: The latest name thrown into the Old Line State rumor mill is that of former RNC chair and ex-Lt. Gov. Michael Steele (R), who recently said he was considering the race. With Gov. Martin O’Malley (D) term-limited, there could be numerous candidates battling for each party’s nomination heading into the June 2014 primary. While Steele mulls the race, Harford County Executive David Craig (R) and Delegate Ron George (R) have officially entered on the Republican side, with others still considering. As for the Democrats, the dynamics of race and geography could determine the nominee. So far, only Lt. Gov. Anthony Brown (D), an African-American, has declared his candidacy, but given Maryland’s Democratic disposition, Brown will not have the Democratic race to himself. Attorney General Doug Gansler (D), who is viewed by many as Brown’s chief rival for the Democratic nomination, has more than $5 million in his campaign coffers and is expected to announce his own bid. Both Brown and Gansler are from metro Washington, D.C., and another D.C. area pol, state Del. Heather Mizeur (D), is also building support for a possible run. But Rep. Dutch Ruppersberger (D) is also reportedly contemplating a run, and would be the lone Baltimore-area Democrat in the race if he enters. In a potential three- or four-candidate Democratic primary, having strong regional support could put Ruppersberger over the top. However, Brown’s status as the lone black Democrat in a state with a large African-American population could also prove decisive in his race for the nomination. We are a long way from knowing the matchups in the land of crabcakes and football, so in the meantime we’re calling this race LEANS DEMOCRATIC because of the state’s general political lean. Massachusetts: Any discussion of the Bay State gubernatorial contest starts with one big question: What will ex-Sen. Scott Brown (R) do? Recent polls from UMass and PPP show Brown leading all potential Democratic opponents, making him far and away the strongest possible Republican candidate in this race. Having passed on Massachusetts’ special election for U.S. Senate, a gubernatorial run in 2014 would make a lot of sense for Brown. He remains a relatively popular Republican politician in a deeply Blue state that has a history of electing Republican governors. As we mentioned in our February review of the gubernatorial races, Republicans have actually controlled the state’s governorship for 26 of the past 50 years. Prior to outgoing Gov. Deval Patrick’s (D) tenure, the GOP held the office for 16 consecutive years. Outside of Brown, 2010 nominee Charlie Baker (R) and 2012 MA-6 nominee Richard Tisei (R) have received some mention. However, neither comes close to matching Brown in political clout or fundraising capacity. Treasurer Steve Grossman (D), Rep. Mike Capuano (D) and former federal health care official Donald Berwick (D) are the three major Democrats looking at the contest, and all trail Brown by healthy margins in recent surveys. While we await Brown’s decision, this race is a TOSS-UP. Michigan: With Rep. Gary Peters (D) opting to run for retiring Sen. Carl Levin’s (D) seat and 2010 Democratic nominee Virg Bernero uninterested in another go at Gov. Rick Snyder (R), ex-Rep. Mark Schauer (D) appears to be the likely Democratic nominee in Michigan. Officially announcing at the end of May, Schauer is positioned to cause Snyder trouble in 2014. A recent PPP survey found Schauer narrowly leading the incumbent 42% to 38%, with Snyder’s approval/disapproval at 40%/52%. Since he signed Michigan’s right-to-work law in December 2012, Snyder’s approval numbers have taken a sharp hit. While Schauer may struggle to match Snyder’s fundraising capacity, a Republican incumbent with underwater approval ratings in relatively Democratic Michigan is definitely at risk. We’re now calling this one a TOSS-UP. New Jersey (2013): The death of Sen. Frank Lautenberg (D) presented a quandary for Gov. Chris Christie (R). He faced three choices: He could schedule a special election to fill the Senate seat before November, schedule it to run simultaneously with the general election in November, or attempt to argue that New Jersey law could permit him to appoint a successor who wouldn’t have to run until 2014. Democrats preferred the second choice, hoping to increase Democratic turnout (especially among African Americans if Newark Mayor Cory Booker ends up being the party’s Senate nominee), while many Republicans preferred the third option, hoping to increase the long odds of a Republican winning the Senate seat for a full term. But Christie decided on the first option, scheduling a special election for Oct. 16, 2013, less than one month before the elections for governor and state legislature will take place on Nov. 5. Although there are concerns about the cost and logistics of such a move, Christie’s decision has received backing from the New Jersey court system. Christie’s choice has many ramifications, including possibly negatively impacting his presidential aspirations, but on the gubernatorial front his decision all but ensures his reelection. With Democrats heavily favored to win the Senate special, the resources of New Jersey Democrats will be focused on the Democratic primary for that race rather than the gubernatorial contest. Having voted for a winner on Oct. 16, it’s possible that some Democrats may not show up to vote again on Nov. 5 knowing Christie has the governor’s race in hand, which could benefit down-ticket Republicans in the state legislature. Barbara Buono (D), Christie’s opponent, has become something of an afterthought for Garden State Democrats. And you can see why: The latest poll from Monmouth University finds her trailing the incumbent 61% to 31%, just one of a flood of polls giving Christie a monumental edge. Given Christie’s maneuvering and his very strong poll numbers, we are shifting this race to SAFE REPUBLICAN. Oregon: On paper, Republicans should be able to at least compete for the state’s governorship and a couple of U.S. House seats. But there has been zero buzz about any of the state’s major races, which is good for Gov. John Kitzhaber (D). However, “Kitzhaber has not yet said if he will run for reelection next year and he has not been conducting extensive fundraising,” according to Oregonian political reporter Jeff Mapes. Still, this race is SAFE DEMOCRATIC for now, assuming Kitzhaber ends up running for his fourth (non-consecutive) term. Virginia (2013): It’s Attorney General Ken Cuccinelli’s (R) turn to suffer in the Virginia gubernatorial race as running mate troubles and ethics questions have arisen. As we pointed out after E.W. Jackson (R) won the GOP nomination for lieutenant governor at the party’s May convention, Jackson could prove to be an “unwelcome, major distraction for Cuccinelli.” Thus far, Jackson has made national news for his comments that practicing yoga could lead to Satanic possession and that Planned Parenthood has been more dangerous for African Americans than the KKK. Needless to say, Jackson’s nomination hasn’t helped Cuccinelli’s efforts to project a more moderate appearance. Unsurprisingly, Cuccinelli has attempted to distance himself from Jackson, pointing out that Virginia voters have historically determined their votes for governor, lieutenant governor and attorney general independently. While Cuccinelli has plenty of political reasons for making this argument, he’s not wrong: In the 11 elections since 1969, Virginians have only elected straight-party tickets five times. Virginians have a track record for separating each office from the other when determining their votes, which may mean that Cuccinelli will be able to avoid being dragged down by his controversial running mate. However, Cuccinelli is also dealing with ethics questions over assistance his office may have provided two energy companies involved in a possible class action lawsuit by the state. Generally speaking, Cuccinelli hasn’t had the best month of his political life. But this doesn’t mean his opponent, former DNC chairman Terry McAuliffe (D), is necessarily heading for victory in November. Prior to Jackson’s nomination, McAuliffe was taking his own turn in the media doghouse. Reports arose that McAuliffe, who has campaigned on his business credentials, had quietly resigned the chairmanship of his electric car company. Another venture in the wood pellet business has also not been quite up to snuff. Perhaps it’s no wonder that McAuliffe has recently been talking more about the company he started as a 14-year-old than his recent business activities. Still, despite his own problems, McAuliffe has been gaining favor with many of the state’s business leaders, who have always been wary of Cuccinelli. Polling still shows this race is very close, though the most recent surveys from Quinnipiac and PPP have McAuliffe narrowly leading. Nevertheless, we wonder if McAuliffe might be hurt by the fact that the June 11 Democratic primary resulted in an all-white male ticket. Could a lack of diversity harm minority turnout in November? To sum it all up, both candidates have myriad problems, and this contest is definitely still a TOSS-UP.